The elegant, long woven gold sautoir necklace from Tiffany & Co embodies versatility and grace. 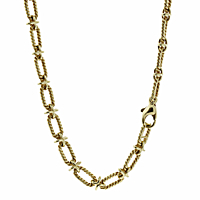 30" in length, it features solid 14kt yellow gold, oval links with a braided design that are connected by smaller, classic Tiffany high polish cross elements. 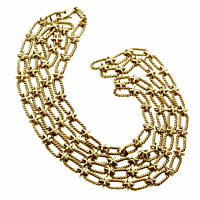 The versatile length allows it to be worn long or doubled as a choker.